There’s no escaping the simple truth that some days go better than others. And on those “other” days, I do a lot of counting. And then there are the days that I am beyond counting. But I was even less proud when my husband laughingly told me to look at the back of our bedroom door. 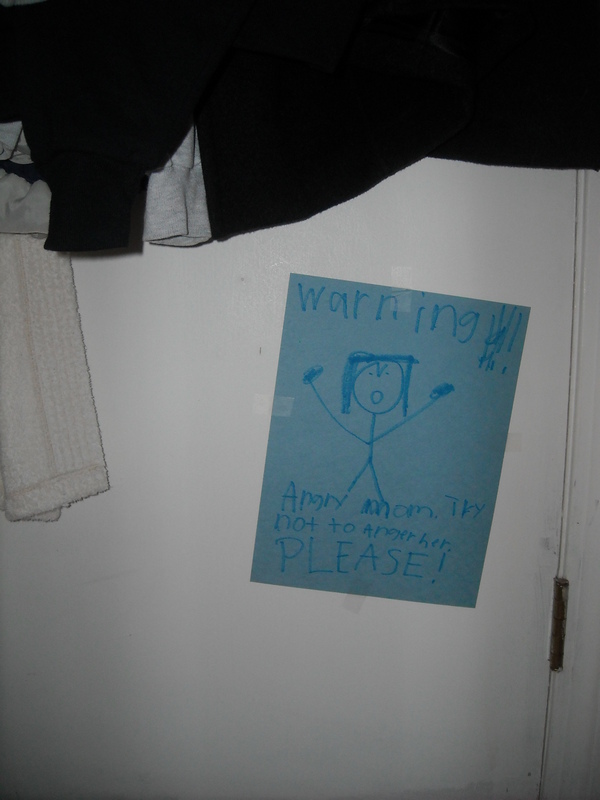 At some point in the recent past, the kids made and hung signs all over the upstairs—Nora’s room, this way. Enter if you dare. Etc. They were cute. Plus, it occupied them for a full hour. According to that picture, not only are you mean, you are having a very bad hair day. Keep counting, friend!! Oh Mary, I am so right there with you. I am amazed at what I hear myself yelling at the kids some days … I figure if I only lose it with them twice a week I’m doing pretty darn good. Usually it’s more like 3-4. It’s mostly scary when I hear my mother’s voice coming out of MY mouth. That usually shocks me into silence. Thanks for the comments; keep ’em coming! If my boys could spell that well, that would be the sign. Thanks for reminding me I’m not the only one!